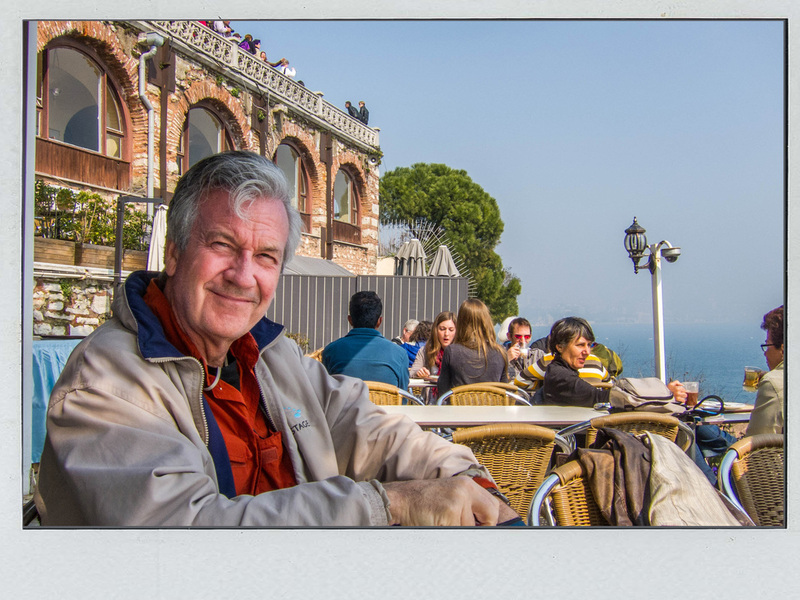 A valuable tip that I've learned from Rick Steves' guidebooks is to get an early start when visiting popular travel sites. 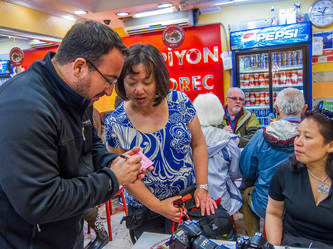 Mert followed this rule throughout our tour and we were able to get a close look at special places rather than peeking through crowds. 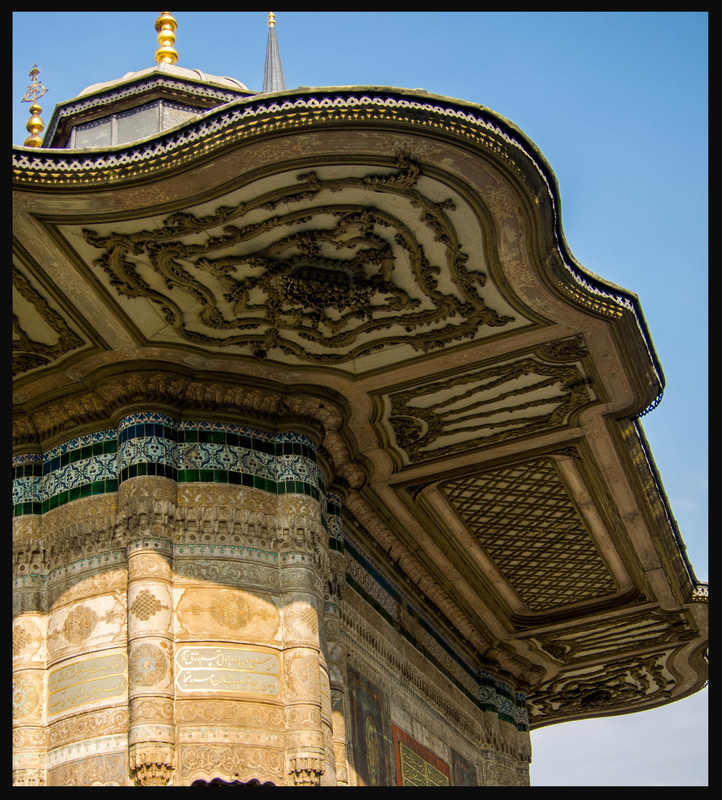 Therefore, we were one of the first groups to enter Topkapi Palace's Imperial Gate. Another advantage of getting started in the morning is the early light. I think it's softer and much better for taking photos. This small building outside the gate was a public fountain in the 1700s. Very few people in Istanbul at that time had a private source of water. It's still used today by residents of the city. Several guards were standing at the entrance. Although he's serious on the job, this young man was friendly and helpful when we asked questions.. Walking through the elegant Imperial Gate, we entered into a large wide-open area. My first impression of this parklike space, made separate by the surrounding walls, was one of calm and serenity. Over to our left was what could have been a palace but was instead a church, Hagia Irene. While not the original structure, we were told that there had been a church here since the 4th century. The first courtyard of Topkapi and Hagia Irene church. After walking through the First Courtyard, we entered through the Gate of Salutation into the smaller Second Courtyard. This is where the Sultan would meet his subjects. Since there were still only a few other visitors, we went immediately over to tour the Harem, which can become very crowded. This tree (still living) must have a lot of stories to tell. My favorite place inside Topkapi Palace was the Harem. Each room was more amazing than the next, and there were over 20 rooms! We learned that a Sultan's Harem wasn't the 'wild party' kind of place that Westerners imagine. In fact, the Sultan was allowed only four wives and a very few 'favorites'. Also, with all the scheming and conniving for favor that existed, it seemed as if it could have been quite a stressful place to live! Did I mention strangling? A lot of that went on too. The decoration, however, was spectacular, with endless varieties of hand-painted tiles and floral (the tulip is a favorite flower) design. These details of wall designs show the vibrant colors and variation. The wall detail on the left mixes mother-of-pearl and tiger eye. Bright blues and reds are the predominant colors of the painted tiles. One of the sumptuous sitting rooms (there were several of these) with walls of painted tiles and calligraphy inside the Harem. I especially loved this inner courtyard inside the Harem. 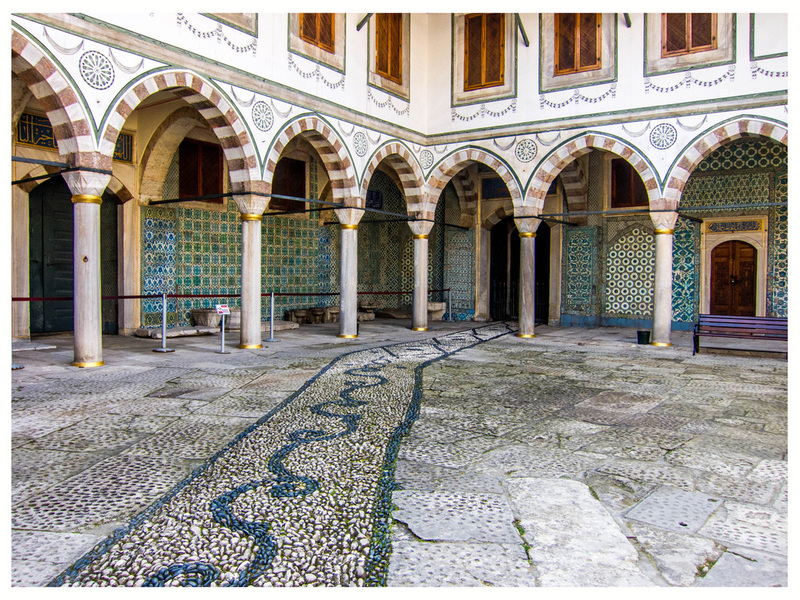 The cobblestone path down the middle was specifically used for the Sultan to make a grand entrance on his visits. Mert gave us free time to see the rest of Topkapi. Fred and I visited the Tulip Garden, the Imperial Treasury, with fist-sized diamonds and emeralds, and the Hall of Holy Relics. In this hall, an Imam was chanting verses from the Quran. We were told that this has been going on 24 hours a day since the 16th century! Wow! That's hard to contemplate. Fred enjoying his tea on the terrace. After four official courtyards and countless rooms, Fred and I took a break. We relaxed at an outdoor cafe with views of the Bosphorus. 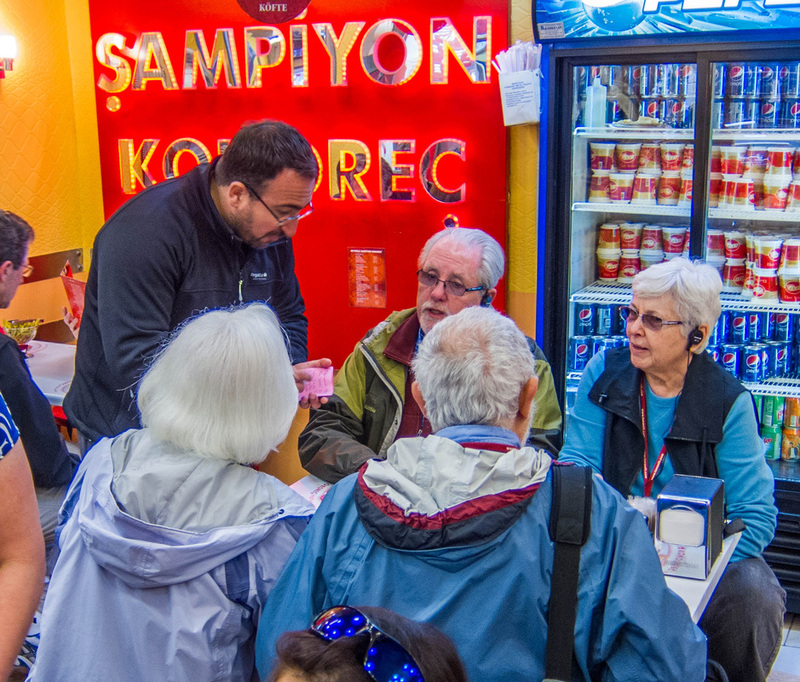 Leaving Topkapi Palace (now packed with visitors), we drove over to Istiklal Street for lunch. 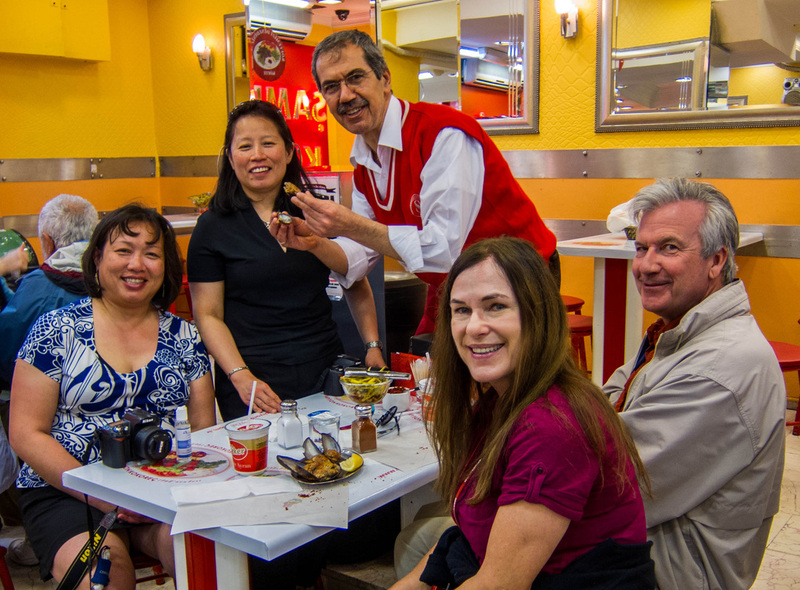 Everyone followed Mert, who had us savoring the stuffed mussels at one of his favorite restaurants. 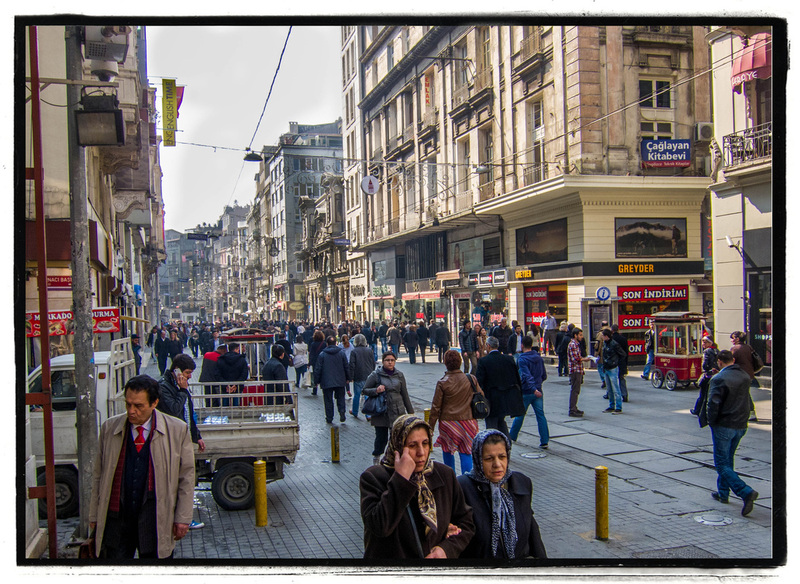 Istiklal Street is all-pedestrian and was jammed with people. I have an idea that it's always busy. 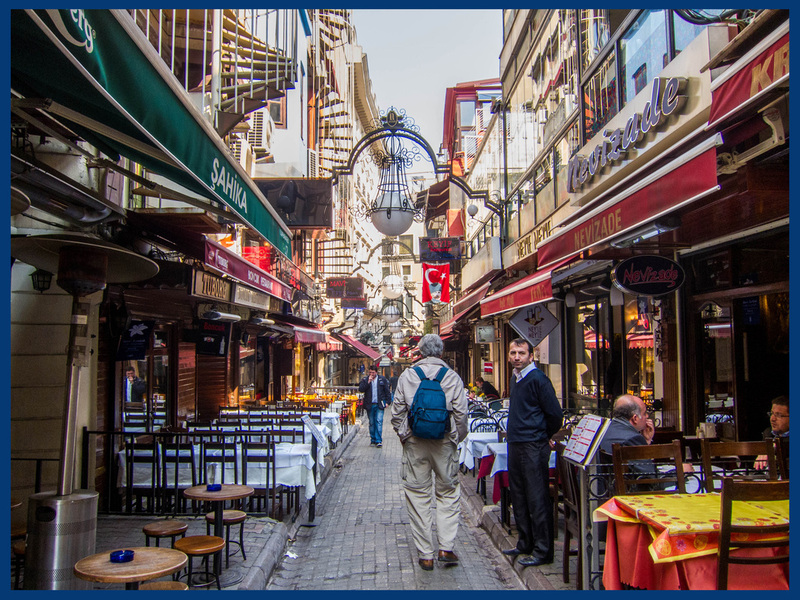 This is what's called Istanbul's New District and we learned that it's filled with mostly local residents rather than tourists. Here's a pictorial lunch story. Mert took orders for everyone. I think we all had the stuffed mussels and they were a huge hit! Full and satisfied after our meal, Fred and I used our free time and found some nook and cranny side streets to explore. We walked all the way up to the top of the street at Taksim Square, where there's a large monument honoring the 'Father of Modern Turkey', Mustafa Kemal Atatürk. 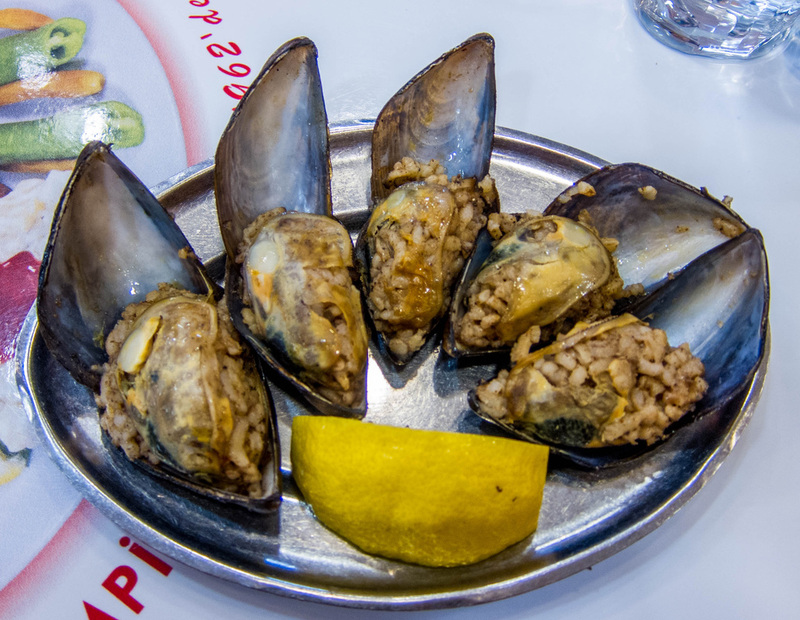 His name and likeness are seen in many places throughout Turkey. Street entertainers perform along the street. This group had attracted a small audience. We listened for awhile and thought they were pretty good, even though we didn't understand any of the words. 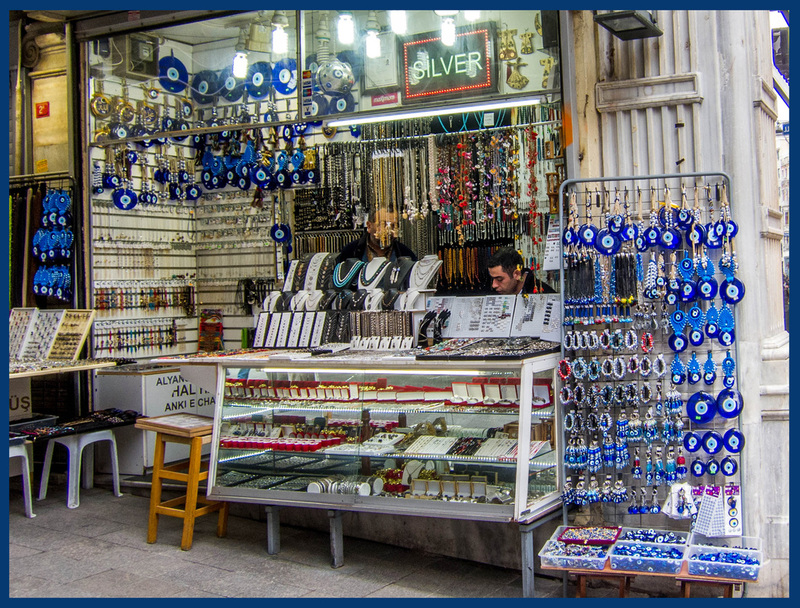 One example of a vendor store selling 'Eye of God' or 'Evil Eye' symbols. They're for sale all over Istanbul. I wish I'd had time to ride this sweet little streetcar going back and forth along Istiklal St. 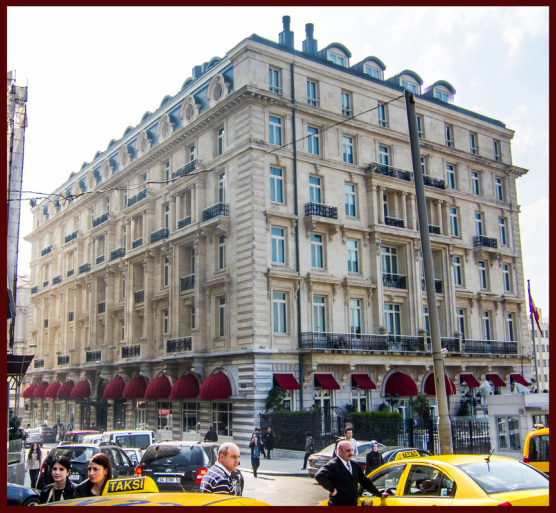 I'm a fan of Agatha Christie's books and was VERY excited to visit this hotel, which I read was built in 1892 to accomodate guests arriving on the train from Paris, the Orient Express. Besides Ms. Christie, it was also the 'temporary' home of many spies during World War II, since Turkey was a neutral country in that war. 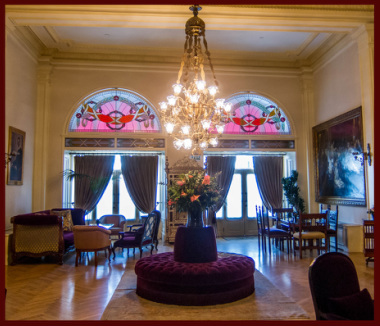 The interior still has its 19th century feeling and elegant decor. I figured that if I were going to try authentic Turkish coffee, what better place than at the Pera Palas Hotel. Locals drink it straight - I asked for sugar with mine, which is added during preparation. It was good, strong, and a little muddy at the bottom.